Dogs are man’s best friend, but did you know that they can suffer from digestive diseases and inflammatory bowel diseases too? A new study published in the British Journal of Nutrition aimed to investigate how dog foods could be ‘functionalized’ by the addition of potato fiber. This prebiotic promoted the production of many important molecules and shifted the microbiome in ways that may be critical to gut health. In the study, numerous dogs had their feces sampled for their microbiome in addition to metabolites. A control group was fed a normal diet and an experimental group was fed the normal diet with the different amounts of potato fiber. All of the dogs’ microbiomes were richest in Firmicutes, regardless of diet. However, dogs given potato fiber had an increase in Firmicute abundance, as well as Bifidobacterium spp. and Lactobacillus spp. Both Bifodobacterium and Lactobacillus are common probiotics that are shown to promote gut health in humans. In addition, one particular bacterium, Faecalibacterium prausnitzii, was shown to proliferate after the potato fiber was added to the diet. This bacterium has also been related to decreases in IBD in humans. Finally, the dogs that ate potato fiber had an increase in butyrate, short chained fatty acids (SCFAs), and an overall decrease feces pH. Each of these has been implicated with lower incidence of IBD. 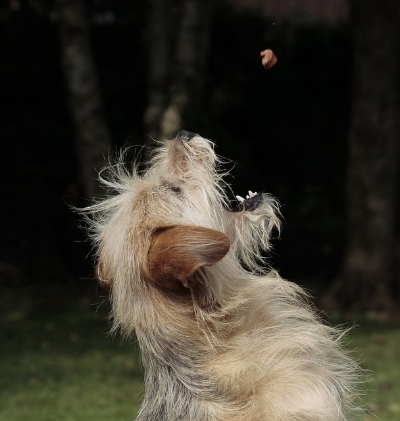 This study was one of the first to investigate prebiotics in dog food. The simple addition of potato fiber, a complex carbohydrate, had important changes on the microbiome, including the production of SCFAs which we have blogged about in the past. Potato fiber may be an easy, inexpensive dog chow additive for all dog owners and lovers to help their pets lead happier, healthier lives. Older PostHappy Thanksgiving to all our readers!